There is always a good reason to love Lady Gaga, whether that be her back catalogue of absolute bangers, or her daringly creative sense of style. Perhaps one of her greatest attributes is her candidness when speaking about mental health, with many of her fans gaining strength from her words of support. 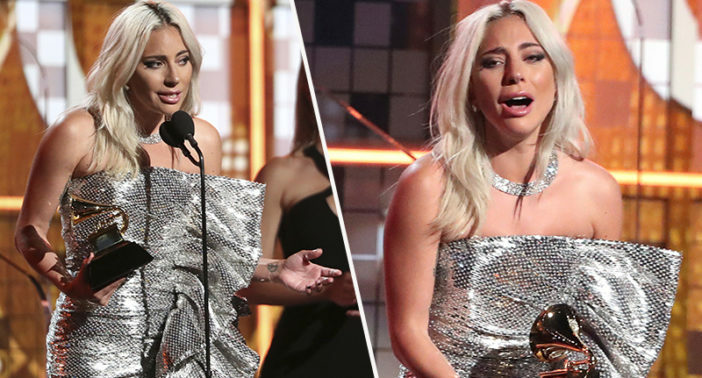 While accepting her third Grammy of the evening – bagging a well-deserved Best Pop Duo/Group Performance for A Star is Born’s Shallow – Lady Gaga spoke up once again about a cause close to her heart. A lot of artists deal with that. And we gotta take care of each other. So if you see somebody that’s hurting, don’t look away. And if you’re hurting, even though it might be hard, try to find that bravery within yourself to dive deep and go tell somebody and take them up in your head with you. I wish Bradley was here with me right now, I know he wants to be here. Bradley, I loved singing this song with you. Fans have since praised Lady Gaga for using her platform to discuss an issue which reaches far beyond the bright lights of Hollywood. Lady Gaga likely just saved hundreds of lives from giving her message about mental health on the grand stage that she did. It’s amazing how words lead to openness, which leads to hope for so many. OK, I’m rethinking the whole thing. @ladygaga just threw down the most beautiful message for mental health awareness, a call to action for us to care for everyone, and a prayer for strength for those in need. Just beautiful … I love awards shows now, sold. I really respect lady gaga so much and I’m so glad she’s incredibly vocal about mental health. we really do need to emphasize how important asking for help is. it shouldn’t be seen as weak to tell someone you need help. Hopefully Gaga’s powerful words of encouragement will resonate with those who are currently struggling, renewing their sense of hope that things can and will get better.